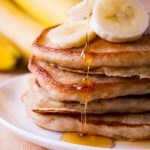 These light & fluffy banana pancakes are like banana bread in pancake form. Start your morning with this easy recipe! I love breakfast. And I also love making breakfast. Pancakes, muffins, waffles, smoothies…. Making breakfast is my kitchen therapy. And what could be better kitchen therapy than pancakes? Delicious, super easy, ready in no time & no extra grocery trip required? Zero stress and so, so, so tasty. 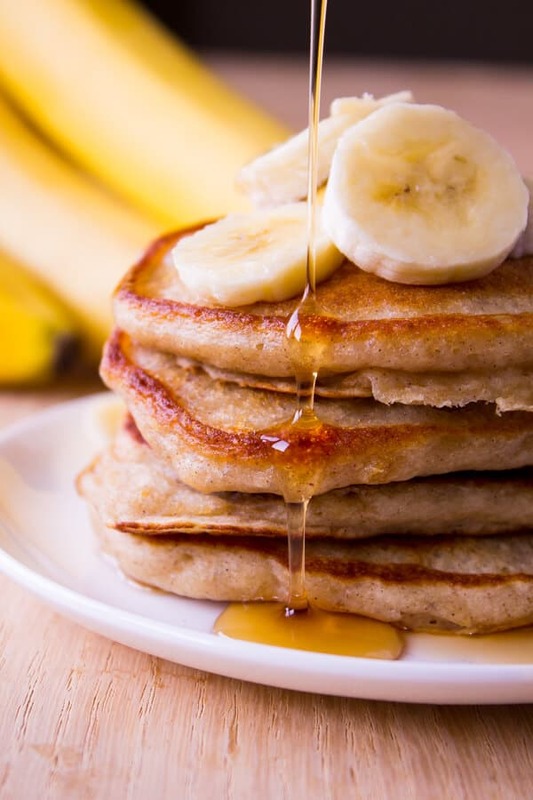 Yup – making these light & fluffy banana pancakes is pretty much the best way to start your day. Now – full disclaimer. Banana pancakes are my favorite. 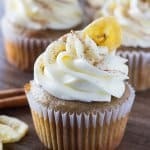 They’re super moist; light & fluffy; have tons of flavor from the bananas, cinnamon & vanilla; and they never taste dry or bland. Even sans chocolate chips – they’re crazy delicious. Now – these banana pancakes are AMAZING. I had them two days in a row in fact. What makes them so delicious is that they use the best of both worlds from banana bread and light & fluffy pancakes. 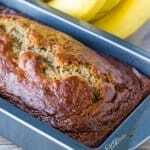 They’re super moist, have a delicious banana flavor, and benefit from cinnamon, brown sugar & lots of vanilla like banana bread. Then – they’re super fluffy, have golden brown edges and taste amazing with whipped cream & maple syrup just like your favorite pancakes. Making them with buttermilk is the trick to super light & fluffiness. Banana bread + pancakes = love. To make these light & fluffy banana pancakes, all you’ll do is whisk together your dry ingredients in a large bowl. Then you’ll mix your wet ingredients – your ripe bananas, egg, butter, buttermilk & vanilla – in a separate bowl. Add your wet into your dry and mix til almost combined with a rubber spatula, and you’re done! To keep your pancakes fluffy, you only need to mix the wet into the dry ingredients until just combined – a few lumps are totally OK! Here’s to being lazy! Then pour about 1/4 cup of batter onto your griddle or frying pan – then when you see bubbles on the uncooked side, flip ’em over and continue cooking for about 2-3 minutes. These pancakes taste amazing with some chocolate chips sprinkled in – but they’re also amazing totally plain. Douse them in maple syrup or maybe sprinkled with icing sugar – and you’ve got yourself quite the feast. Jack Johnson totally optional! these sound wonderful but they look rather high carb. any idea how high in carbs they are please? 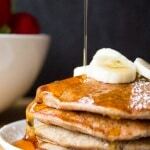 I’m not sure of the nutrition information for this recipe, but if you’re looking for a healthier option I’d try my Skinny Banana Pancakes instead. They taste delicious but are a lightened up version of this recipe. I hope you like them! They’re pancakes, if you’re worried about carbs don’t eat it! I hope you both loved the pancakes! I just discovered your blog and LOVE it!! I signed up for your newsletters. These pancakes look so good and I love banana anything. Do you happen to have a homemade pancake syrup to go over these? I have tried many syrups from the grocery store and haven’t found any that I like and would buy again. Thank you so much! Very fluffy and yum!!!! I tried using buckwheat flour. It still turn out awesome! Thank you for sharing the tips for buttermilk too. My picky husband really loved these!